Social Studies are the study of the interactions among human beings and between human beings and their environment. Interactions between self and others are the most important topics of study, and the classroom presents infinite opportunity for exploring many issues. During the primary grades, students focus on self, family, and community. As students move through the grades, the social studies curriculum moves outward and becomes more global. A multicultural perspective is explored at every level. In this sense, students learn not only about the world in which they move, but also about the world within which they live. While each required content area is addressed during K-8, it is not necessarily addressed in the same order as in other local schools. Literature, writing, art, and music are integrated into social studies instruction. Simulations, such as Gold Rush Days bring history and social studies to life. Independent study, and culminating projects (e.g. 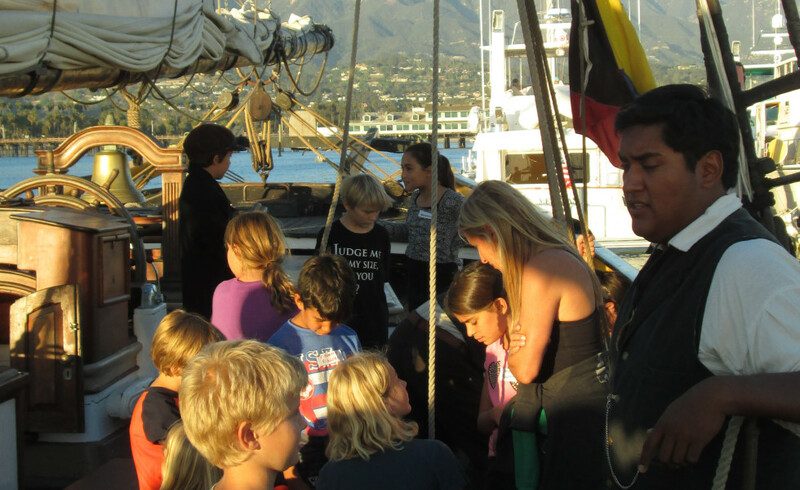 The Chumash Museum, Colonial Days) provide rigor and assessment opportunities. Field trips often reinforce learning in social studies. Learning to be participants in our cooperative school community is a critical part of our social studies curriculum. Serious attention is paid to the development of interpersonal communication, problem solving, and conflict resolution skills. Classrooms operate as caring communities. Students have an opportunity to explore values and ultimately express some of these values through community service. All students have the chance to participate in service learning projects. * The teachers: they are fabulous, dedicated to the students, and providing a wonderful and rich environment for the kids to come and learn in. * The academic program: we appreciate the focus of the school, and the approach to the curriculum. It is clear that students develop a love of learning while going to SBCS. * The community of parents: it is clear that SBCS parents are very invested in the education of their children. Their participation in the running of the school reflects that commitment. The support they provide to the teachers is second to none, and the overall feeling of community is felt at so many levels.